Laguna Wetlands Preserve in Laguna de Santa Rosa is the largest freshwater marsh in Northern California. The oak woodland and vernal pool complex surrounding the wetlands of the Laguna ecosystem once provided food to antelope, elk and deer herds. The Laguna is now a premier bird-watching area, though other wildlife is occasionally spotted. 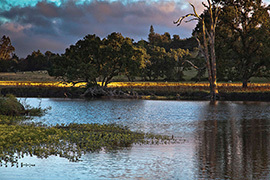 The largest tributary of the Russian River, the Laguna drains a 254-square-mile watershed. Kayaking and canoeing in the Laguna is possible only in winter and only when rainfall has been significant within the previous one to two weeks. A short walking trail adjoins the Laguna channel and loops around the City’s former wastewater ponds. From late Spring to early Fall, a floating pedestrian bridge is in place to connect to a trail on the east bank of the Laguna channel. The Laguna de Santa Rosa Trail is one of Sonoma County Regional Parks’ newest trails, offering a unique opportunity to see the biologically diverse landscape of Sonoma County’s largest freshwater wetland. The trail runs on the east side of the Laguna channel between Highway 12 and Occidental Road, with trailheads and parking areas located off of both roads. A 1.8-mile multi-use trail is open to hikers, cyclists and equestrians and includes an overlook area with benches and Laguna and vineyard views. Paved with crushed stone, the trail is fully accessible for wheelchair users. Laguna Wetlands Preserve in the city of Sebastopol is the best place to access the Laguna itself. You can walk the gravel trails past ponds and marshes to the seasonal bridge, or sit on benches under towering valley oaks and Oregon ash. A two mile hike encircles the entire area. Trails are accessible to walkers and wheelchairs but not bikes. Dogs allowed on leash. The Laguna Foundation (celebrated its 25th year in 2015!) offers lively, informative docent-led walks in the Preserve.